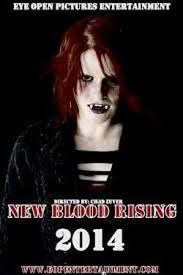 In this vampire film we follow the last 3 remaining vampires in the world, Jade, sister Ophelia and brother Bryce trying to restore their bloodline and raise their own army of vampires. To do this they need the blood of a pure innocent who they find in Brie, a young girl turning on the rebellious side of her father. Though to do this they must contend with her (unbeknownst to her) protectors The Hunters, lead by Archer with his less then excitable team of Karver, Riley and Ash who's pure aim is to destroy vampires from the world. Ending with a scene within the credits of....well you just have to watch the film, but lets just say it will be explained more in the sequel (New Blood: Awakening). The aim of the film is simple and played out well, though some characters make you want them to be killed off soon. The editing could be a bit tighter and some how the lead vampire Jade (played by Kayla Elizabeth) has time to change her hair throughout the film and for me I found a little boring, I would have had Ophelia as the lead vampire. Continuity, some bad editing and a few annoying characters shouldn't make you NOT want to watch this movie. Stick through it as the script is pretty well done and the story is played out well. Not bad for a film shot on $100.